The story of when I decided to learn to bake is sad-funny. As I have discussed before I learned to bake from cookbooks, what I haven't talked about is when or why I started baking in the first place. It's a story that goes back to my great-grandmother's funeral. My mother was the oldest of 12 kids and was always close to her grandparents. We went up to visit every summer and my mom spoke to them on the phone a lot. After my great-grandfather passed away I was lucky to be given one of the metal donkeys that he crafted out of old bolts and screws. I still have it and my children have heard exactly where it came from and that one day it will be theirs. When my great-grandmother was in her 90's my mother decided that I should go and spend some time with her for the summer. I was 12 and she lived in a very small town in Eastern WA. So for a week I spent time with my 93 year old great-grandmother. She taught me to spin wool on a wheel, to weave with an old fashioned weaving board and to write. One of the most important things she taught me was that I should remember everything by writing it down. She gave me a journal to write all about my stay, and I did. I took pictures of her, I drew and I wrote. Not long after my trip she passed away. I was one of the last people to spend a lot of time with her and I cherish the memory. At her funeral there was a beautiful cake. It was a beautiful day and that cake was gorgeous. Until I took a bite, it tasted like rose water. Not a little bit, but entirely like rose water. My mother took a bite and burst out laughing. It was disgusting. We both decided that my great-grandmother would have hated it and would have probably said something sarcastic. She was very opinionated (something that I am glad to say I inherited). It was then and there that I decided I would learn to bake. Not a cake that tasted like rose water, but an actual cake. And so I did. Now days I bake for my kids. I tell them stories about the strong women in my mom's family (great-grandmother, grandmother, and my mom) that they will never be able to meet. I hope that through me they will learn a little bit about how to low to bake and cook and to love the family that they came from. Today I tried a new recipe for Trail Mix Treasures from the Ocean Spray website. This recipe has 6 ingredients. I followed the recipe pretty closely to how it was written. Instead of using semi-sweet chocolate I used all natural dark chocolate chips. I prefer using dark chocolate in baking, especially if the recipe is already sweet. I sprayed the pan with non-stick spray in order for it to stop from sticking. Since I was unable to find gluten free rice krispies at my local store, this became a treat for everyone, but me in the house. I did eat a number of chocolate chips out of the bag, I have a bad habit with that. While the dark chocolate chips were good, I think this recipe would also be great with white chocolate chips. 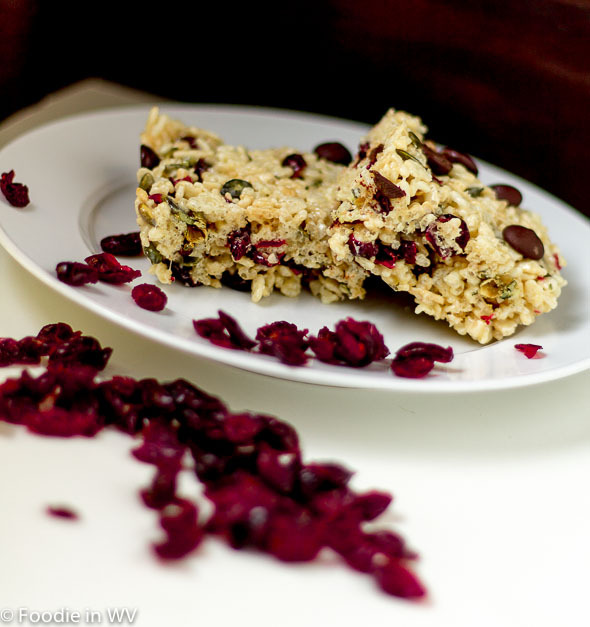 White chocolate chips and dried cranberries seem to go hand in hand. I cut big pieces so I ended up with 12 pieces in total. My oldest son was not a big fan of the roasted pumpkin seeds, but my youngest disagreed. If your kids don't like pumpkin seeds roasted almonds or cashews would be great substitutes. For the recipe go to Trail Mix Treasures. I will must try it.. It is so great that you are telling your children stories about their family. It gives kids such a sense of connection to know about the family that came before them. Apparently, you taught yourself well, you have such great recipes. Since they won't be able to know many of them I try to pass on as many things as I can! Looks delicious! Using dark chocolate is a good idea! I love dark chocolate, it's yummy! It really was a nice time and a great memory! anyway- as always an inspiration!!! Cranberries and dark chocolate are SO good together! I agree, they just work! What a great story! Too funny about the cake :o) I think it's wonderful that you are sharing something, like baking, with your own family and are able to remind your children about where your love for baking and cooking came from :o) What a fantastic way to keep the memories alive! What a great story! I didn't loose my great-grandmother until just after I started college and I spent a lot of time with her growing up too. She was an amazing baker. I have to admit that I'm not the biggest Rice Krispie treat fan, but I think I'd like these. Dry cranberries and chocolate chips? Yum! They don't taste like regular rice krispie treats, they have a more adult taste. That's awesome that you got to spend so much time with your great-grandmother! What an interesting woman she was. This sounds really good. My kids would probably like it too. She really was :) My kids loved them (except my oldest would have rather had almonds than pepitas). Ps what an incredible story about you Great Grandmother! That's so special you got to spend all that quality time with her before she passed away. It really was nice spending time with her before she passed, I cherish the memory :) Thanks for the share and sweet comments! What a lovely story! It is so nice that your great grandmother inspired you so much to do this for your own children, and now we get to benefit too! She really was a great women and I hope that I am passing at least a little bit of her onto my kids! It is always amazing what inspires us. This is a beautiful story, Love it. Thanks for the sweet comment :) It is interesting finding out what inspires each of us! I LOL at the rose water cake. I'm happy to got to spend some quality time with your grandmother and she would be happy to know that you turned out to be an amazing cook. Hope you're having a great week! Thanks :) Have a great week as well! Trail mix rice crispy treats! This would make a great snack to take anywhere with you. Great story about your grandma. Mine is also in her 90's now and I need to visit more often. It really is a great snack to take on the go! Thanks :) They would work with nuts other than pepitas too - almonds, cashews, pecans. Thid look really beautiful Ann!! Thanks :) I love that they had nuts and dried fruit! I love the combination of white chocolate chips and dried cranberries too! Can't wait to try them in this recipe. The combination really is great! I put things off too, so I understand :) If you end up making a batch let me know!